By Sean Jones: Brandon Rios (35-4, 26 KOs) will be stepping inside the lion’s den this Saturday night to face Humberto Soto (68-9-2, 37 KOs) on his home turf LIVE on DAZN at 7:00 p.m. ET at the Auditorio Municipal, in Tijuana, Mexico. This will be a bout that takes place at junior middleweight. Rios started his career at lightweight. Soto has fought mostly at featherweight. He’s now campaigning at welterweight. Just how well Soto handles fighting at 154 will be interesting to see. That’s almost 30 lbs over Soto’s best weight. For Rios to be fighting at 154, it begs the question of how hard he worked in training camp to get his weight down, because he’s not a natural junior middleweight in terms of size. 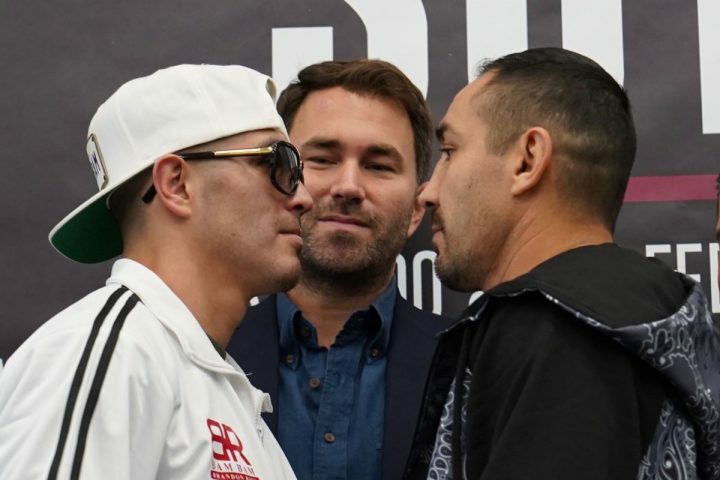 This is Rios’ second fight of three-fight contract with Matchroom Boxing promoter Eddie Hearn, and he’s hoping that he’ll be given a world title shot at welterweight if he can beat the 38-year-old Soto. Rios is fighting Soto in his hometown of Tijuana, and that could make it tough for him due to the pro-Soto crowd. Rios isn’t worried about it though, as he believes that he’ll be able to shut out the crowd and focus on Soto. Still, it’s going to be a tough fight for Rios to have to deal with a talented guy that has a lot of experience, and has achieved more as a pro than he has in winning two division world titles. It’s kind of asking a lot for Hearn to line him up for a crack at a world title when he’s not ranked in the top 15 by any of the sanctioning bodies at 147. That might change if Rios can beat Soto on Saturday night, but it’s not likely that Rios will get a top 10 ranking. In Rios’ first fight of his three-fight deal with Hearn’s Matchroom Boxing promotional company, he defeated Ramon ‘Inocente’ Alvarez by a ninth round knockout on November 17. Alvarez is the brother of WBA/WBC middleweight champion Saul Canelo Alvarez. Ramon doesn’t possess the same kind of talent that Canelo has going for him obviously, so it wasn’t unexpected that Rios was able to beat him. Alvarez is no strange to losing, having been beaten by the likes of Omar Chavez and Antonio Margarito. Rios beating him doesn’t mean that he’s turned his career around all of a sudden. It just means he was able to beat a second tier fighter with limited talent. Rios was retired for a year and a half after his ninth round knockout loss to Tim Bradley in November 2015. He stayed out of the ring until making a comeback in June 2017 in beating Aaron Herrera by a seventh round knockout. Things fell apart for Rios in his next fight after that when he returned to the ring seven months later and was knocked out in the ninth round in February of last year. Rios admits that he cut corners in preparing for the fight with Garcia, and he wasn’t at his best. Rios landed a lot of shots on Garcia, and had him marked up. If Rios could have gotten a little more from his game, it would have been interesting. What stood out in that fight was Rios’ lack of punching power at welterweight. His shots were slow, and they didn’t look like they had the same zip on them than the ones that Garcia was hitting him with. “I’m fighting my second fight with him, and I can’t wait to go again,” Rios said about Hearn. Rios doesn’t say what he’ll do if he loses to Humberto on Soto. Although it’s not likely that Rios will get beaten by the smaller Soto, it’s quite possible that it could happen. Soto has a lot of skills, and he’s looked very good in his last 11 fights. He was beaten by Antonio Orozco in 2015, but he performed well enough to be viewed as the winner of that fight in the eyes of a lot of boxing fans. Soto lost to Lucas Matthysse by a fifth round knockout in 2012. Before that, you have to go all the way to 2008 for Soto’s previous loss to Francisco Lorenzo by a 4th round disqualification. Soto dropped a badly bleeding Lorenzo twice in the fourth round. However, while Lorenzo was down, Soto hit him with a shot. Lorenzo stayed down, and the referee opted to disqualify Soto. It was ugly way for Soto to lose. A fight that Soto clearly lost was to Joan Guzman in 2007. Guzman was too fast for Soto, and he was out to out-box him to beat him by a 12 round unanimous decision. Of all the defeats that Soto has had in the last 12 year, only his losses to Matthysse and Guzman were clear defeats in which he lost to the better man. Rios might have made a mistake in taking on Soto. This is a fight where Rios could wind up being out-boxed and out-brawled by Soto. Given that Rios is fighting a guy a lot older than him in Soto, it might be a bitter pill for him to swallow in dealing with a defeat to the old warrior. The good news is that Eddie Hearn hasn’t done a lot of promoting of Rios’ fight with Soto. So if things don’t workout well for Rios, then maybe the casual boxing fans won’t bother hearing about it like they would if Hearn had marked it strongly. It’s unclear which welterweight champion Eddie would be looking to put Rios in with at welterweight. There’s nobody in the division that has enough flaws in their game for Rios to beat them. If Rios is just looking for the payday without feeling he can beat any of the champions, then it won’t be as big deal if he gets beaten. It’s doubtful that Hearn will be able to get Rios a title shot welterweight champions Shawn Porter, Keith Thurman, Terence Crawford or Manny Pacquiao.